I am pleased to announce the posting of an article entitled "Orthodox Ecclesiastical Heraldry" by the late Professor David Pittman Johnson, D.S.W., with line drawings by Cmdr. Valery Pavlovich Yegorov and Natalie Rostislavovna Yegorova, and featuring an Introduction and Commentary by Father Guy W. Selvester, ACH Advisory Board. The article may be found, along with several others, on our website at www.americancollegeofheraldry.org (click the Select Articles link). It will be published shortly in our quarterly, "The Armiger's News," but is available now online. 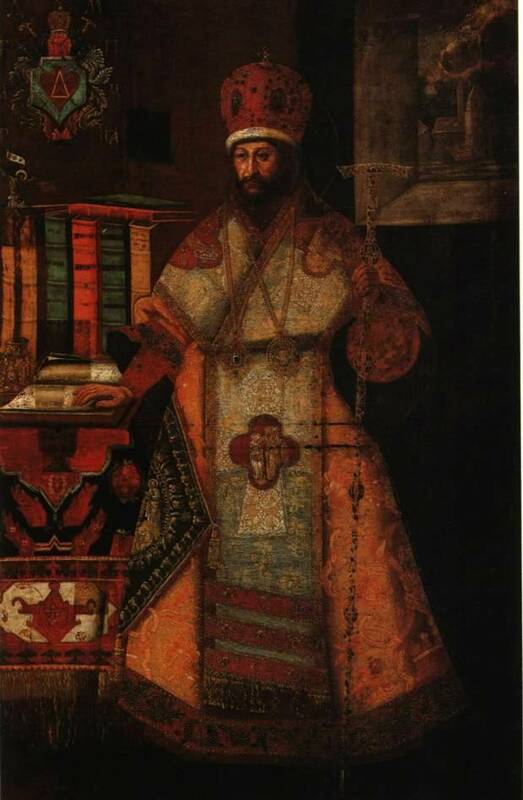 "This article by the late Dr. David Johnson is an interesting attempt to codify in one place the collected knowledge, limited as it is, concerning heraldry in the Orthodox Churches. Generally speaking, ecclesiastical heraldry as we know it was, and still is, heavily influenced by European heraldry. As such, the Roman Catholic and Protestant traditions have developed heraldic systems of their own. However, heraldry is less present in the Orthodox tradition. Nevertheless, in European countries where there is a large Orthodox Christian population, primarily in Eastern Europe, there are distinct heraldic customs, traditions and practices. In Greece, the Middle East and Africa the use of heraldry as we would understand it is not common among the Orthodox Churches. "Dr. Johnson's article serves as an interesting proposal. Some of what he proposes is extrapolated from existing heraldic traditions. Some of it may be in use in some of the Orthodox communities (such as the Russian) while not in others. Because of the decentralized nature of Orthodoxy it is impossible to impose a single unified system on a widely disparate group of ecclesiastical communities each with a distinct identity based on ethnicity and/or nationality. Still, Dr. Johnson suggests some interesting ideas that could serve as an excellent model for those positions held in common throughout the Orthodox world. Since he himself was an Orthodox Christian this was an area of personal and particular interest to him. The ideas expressed in this article may not be agreed with universally but they do give excellent food for thought and discussion. The American College of Heraldry does not necessarily endorse this system proposed by Dr. Johnson as normative but is happy to share this article to which he devoted so much time, effort and energy." I would urge anyone interested in the subject to review this article - one that David Johnson was working on when he passed suddenly 2 years ago, and which was completed with the gracious assistance of Cmdr. Yegorov. Thanks David for bringing this to our attention! Thanks David for bringing this to our attention! If this was found in rough draft form I can only imagine the quality handwriting that was such trademark of Dr. Johnson. That would be a masterpiece of reading in and of itself, even if unfinished. I thank Commander Yegorov, Natalie Yegorova, Father Sylvester and all others that were involved in the completion of this fine work. Arms of The Archeparchy of Chicago and the Midwest of The Orthodox Church in America, as designed by the Very Venerable Igumen Father Vladimir (Wendling). An interesting page on Orthodox Ecclesiastical Heraldry at the blog of The Right Reverend Protoprezbyter-Mytrophor Father Waldemar Janusz Kuchta D.D. With the blessing of His Eminent Grace Episcope of Australia & New Zealand Lord Irinej (Dobrijevich), my Clerical arms were established. They were rendered by Iconpainter Rade M. Pavlovich (Heraldic Artist of The Princely Branch of The Serbian Royal House of Karageorgevich, Heraldic Artist of The CROM-BHGS) in the ancient technique of egg-tempera. Some more Ecclesiastical heraldry from the Romanian Orthodox Church. The arms of Metropolitan Andrey (Shaguna) /1808-1873/. The arms of Nikon, by the Grace of God The Grand Lord, The Most Holy Archepiscope of Moscow and The Patriarch of All Great and Small and White Russia (1605-+1681). The beautiful arms upot the seal of The Metropolitan of Moldavia Veniamin (Kostaki), mid 19th c.
The doubleheaded eagle of the Ecumenical Patriarchate of Konstanitnoupolis. Arms of The Serbian Orthodox Church upon a stained glass window (detail).